Born Charles Richard Parkin Christian, this famed Pitcairner was born on Pitcairn Island in 1883, one of nine siblings of Francis Christian and Eunice Young. “Dem Tull” (a local Pitcairn news letter) described his early life as a witness to some of the major events of the Island’s history, including surviving the typhoid epidemic of 1893 which claimed the lives of 13 Pitcairners. It was around this time that Pitcairners began adopting the Seventh Day Adventist doctrines and Parkin remained a devout Adventist for the rest of his life. Dem Tull continues “ As he grew up he showed himself to be an intelligent, witty and insightful young man. He was considered a masterful and slow speaker, with a sense of humour appreciated by Pitcairners and outsiders alike” (edit). At age 17 he sailed as a crew member on French trading ships plying between Tahiti and neighbouring islands and in the early 1900s began working on sailing ships trading between Pitcairn and Mangareva, some 300 miles away. Parkin Christian married Rosalind Butler (daughter of Peter Butler shipwrecked on Oeno Island in 1875 and Alice McCoy) and had two daughters and one son between 1910 and 1915. As a governmental leader, Parkin served eight terms as Chief Magistrate of the Island, probably more than any other single Pitcairner (with the possible exception of James Russell McCoy). He “kept the Island going” for decades with his common-sense administrative expertise through the Island Council. As a religious leader, he was a long-serving elder of the Pitcairn Island Seventh-day Adventist Church. A quiet but effective advocate of his faith, he gave uplifting spiritual direction to all Pitcairners in his time. As a Pitcairn goodwill ambassador in voyages to the “outside” world, Parkin consistently presented the Pitcairn people as the warm, friendly folk they are. His poise and dignity in doing this in front of many thousands of people brought much good to Pitcairn, and that good continues decades after his death. 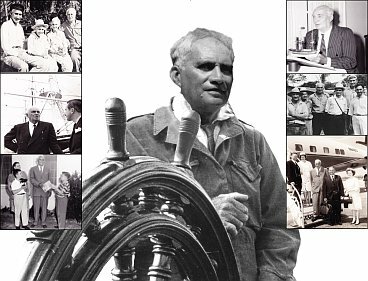 As a man of the sea, no other Pitcairner had Parkin’s level of skill, natively acquired, as a navigator from Pitcairn to distant islands or as a handler, as coxswain, of the Pitcairn boats. His fishing prowess was legendary. In one of his fishing trips in the 1930s he discovered and recovered the major part of the Bounty’s rudder. In 1958 he was quoted in Time magazine as saying “Giving is living”. His work has recently been honoured by Dem Tull Hall of Fame on Pitcairn when Parkin was made their first inductee. 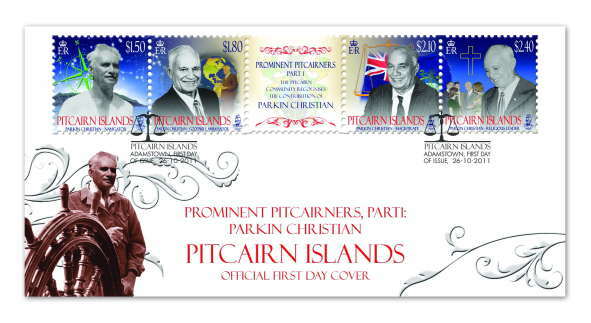 Parkin Christian, the first of this “Prominent Pitcairners” stamp series, died in 1971 in Auckland, New Zealand and was survived by his son Richard (who died in 1974) and numerous grand children including a recent addition, Ayden Warren born on August 17 2010 who is Parkin Christian’s great-great-great grandson. Full Sheet of 6 sets. Acknowledgement: The Philatelic Bureau wishes to thank Herb Ford, PISG, USA, for his assistance in obtaining photographic reference for this issue.